> what Courtillot et al claimed to have done. >knowing they are getting access to the best climate reviewers. > Thomas like me was involved in the 2007 IPCC Report. > as they are not in mainstream climate journals. > (the sun and volcanoes) should have caused a cooling since the 1960s. > Lockwood/Frohlich realise this, but Courtillot et al don’t seem to. 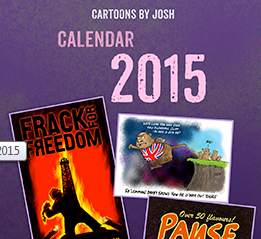 >can only ignore sulphate aerosols (as it is small) earlier in the 20th century. > up then as well (albeit less so). 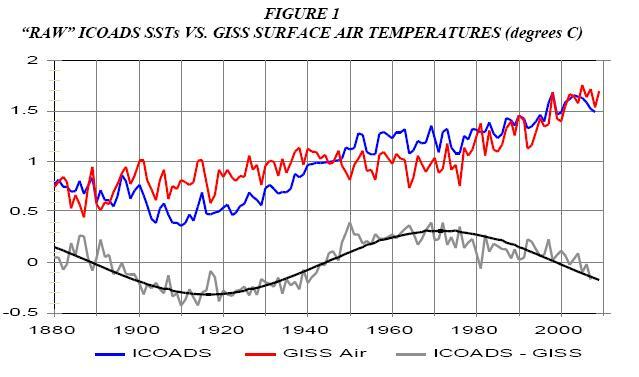 > climate model simulations of the 20th century. Where to start? I think for now I’ll leave aside the issues concerning peer review and barriers to cross discipliniary co-operation around climate science and discuss Phil Jones Woeful lack of understanding of how solar energy is stored in Earth’s climate system. This is (deliberate?) ignorance in all it’s naked glory. Has it really not occurred to Phil Jones and the CRU team that although the peak amplitudes of the solar cycles declined after 1958 the cycles were still well above the long term average since records began? If I start heating a pan of water at gas mark 6, does it start cooling down if I reduce the flame to gas mark 5? The ocean has a very very big heat capacity. If Kevin trenberth believes the lack of warming of the last decade is due to the missing co2 heat being hidden in the ocean deep, why can’t Phil Jones consider the possibility that the ocean retains solar energy on multi-decadal timescales?? Salt in the oceans changed. Yet these scientists did not bother to link this to the differences in solar penetration and precipitation changes. Velocity has a great deal to do with circulation. Water vapor never crosses the equator. The angle of the planet also contributes to the difficulty of going against a faster velocity. Joe, thanks for providing some links to provide background to your ideas. Have you considered the relative power of centrifugal force compared to the other physical processes which affect the position of salt ions in the water column? Ive bookmarked the Curry et al paper for a read – thanks. Centrifugal force is a very interesting in changing speeds. Apply this to other planets such as Venus and due to the LACK of centrifugal force, the gravity is heavier. This is using forward momentum of our solar system as the basis of gravity as a major driver but not totally the cause of gravity. The velocity only drops about 100km/hr to the 20 degree latitude. After that it starts to drop sharply and THAT is where the heavier salt concentrations are located. 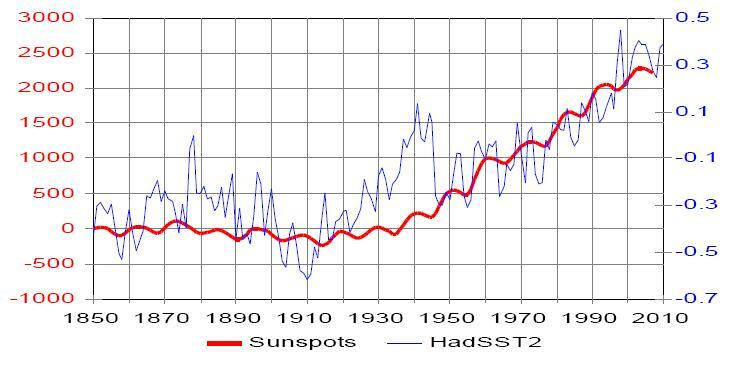 Listen to Hathaway on sunspots, ‘no Grand Maximum, global warming etc. The question of solar heat retention in the ocean is where I came in on this blog, so I thought it might be appropriate to link to some of the graphs I posted earlier that show evidence for a solar-SST link. Of course, none of these examples prove anything by themselves, but when taken together they make it difficult to escape the conclusion that old man sun is the dominant control on SSTs (and presumably OHC) even if we might not completely understand the mechanisms involved. Which brings us to the question of why Phil Jones thinks otherwise. Well, one obvious reason is that he has to – if CO2 didn’t cause the warming then he’s out of a job. But another is that he’s using the “official” HadSST2 series (as do you), and you don’t see these correlations when you use HadSST2. But as noted above HadSST2 is unquestionably wrong, and while I can’t guarantee that the ICOADS series I use is right it’s hard to see how the results shown above could all be artifacts of bad data. 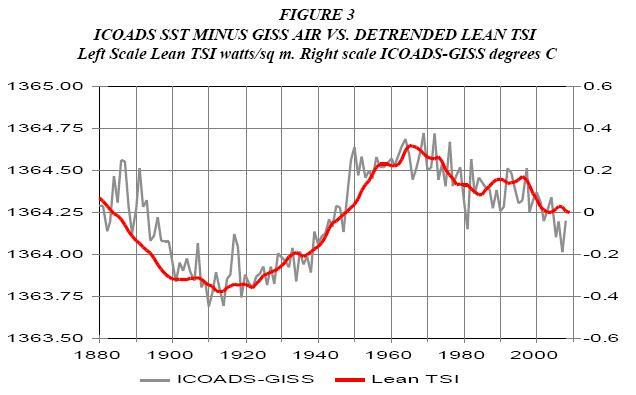 “It is true that, as the alarmists say, since 1961 the average level of TSI has been approximately level if one averages out the peaks and troughs from solar cycles 19 through to 23. Strange, first attempt didn’t show up on my computer. Feel free to delete the duplicate post and this one. Vuk, thanks for the podcast link, I like listening to Hathaway. I’m pretty sure that I do. An active sun alters the vertical temperature profile of the atmosphere especially at the poles so that the polar air masses shrink horizontally whilst the polar vortex intensifies vertically and the jets become more zonal. That results in less global cloudiness and more solar energy into the oceans. El Nino becomes stronger relative to La Nina and the troposphere warms. A less active sun does the opposite. I see you’re down for a meeting in London tomorrow and Friday. Vincent Courtillot. He is making Edouard Bard’s life awful in French. I’m lecturing here in Norwich to students so can’t make it to London. scientists are aware that they have invited a bit of rogue! Historically the effect of a pairing of two of those items is completely unknown in planet history: surface air pressure. It so happens a paper on just that is due from Nature but seems to be delayed. 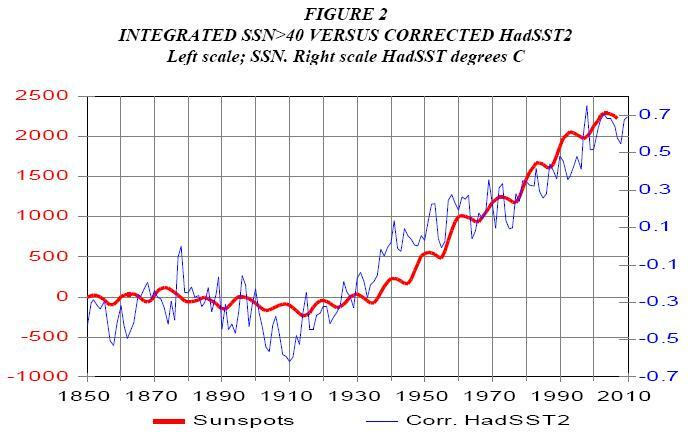 I suspect air pressure was higher long ago and is the likely explanation for the “faint sun paradox”, which has various explanations, none of which work, usually involving hand flapping over greenhouse gases except it doesn’t work. Air pressure is the key. Steven Wilde mentions shorter term air pressure but I’m not sure the change is the same thing I am talking about, which is larger. That said, vapour pressure will play a part. The details of how the atmosphere actually adjusts is still a work in progress, I still don’t understand enough. I might have written too much. Not really ready. Short term redistribution of surface air pressure makes the fine adjustments to energy flow through the system by altering the size position and intensity of the permanent climate zones. Long term it is total global atmospheric pressure that sets the energy value of the latent heat of vapourisation and so the energy cost of a given amount of evaporation. That is what controls the total system energy content (mostly in the oceans) because it sets the rate of energy loss per unit of evaporation. I’ve submitted a guest post to rog which covers this aspect in the context of the entire climate system and which I hope rog will post shortly. It also covers the way the atmosphere adjusts to achieve a stable system energy content in the face of all significant forcings. The faint sun paradox can be resolved by positing a change in the speed or volume of the water cycle since then. Shifting and redistributing the climate zones would achieve the necessary adjustment in the flow of energy through the system. Don’t think there is a conflict. I could probably write a book just on centrifugal force because it is a very large area of study. There are many types of centrifugal force with many characteristics to each type. Angles of strength to weaknesses, etc. For instance at 90 degrees to the rotating flat plane is the maximum strength. A planet has multiple planes due to the different velocities and different angles of curved surface. Changing the angles makes centrifugal force extremely weak. Our planet and solar system have very interesting coincidences that you would not normally notice until someone points them out. What is the size of our planets core? Interesting coincidence is that it is also the areas of the highest electrical activity such as thunder storms. The rotation of planets. Only the first two planets have a very different rotational velocity. The rest of the planets are withing one day no matter the size or density. If people did not think differently from one another, we would loose that ability to explore different avenues. Our biggest problem is communicating out what is in our minds to one another. Thanks to tchannon for linking to my ‘Pot Lid’ paper above. For whatever it is worth, the faint early sun paradox is easily explained using the argument in my paper. I considered adding a section to spell this aspect out, but decided the paper was plenty long and controversial already. Adding water vapor to the atmosphere causes a massive rise in temps in the upper troposphere. This is Meteorology 101, the fall in lapse rate from 9.9 C/km to a global average of 6.5 C/km. 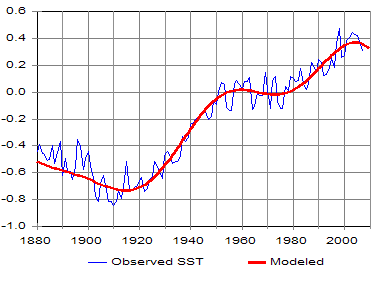 Such a rise in temps ought to cause a similarly large downward shift in density, cooling the sea level air. Again, it’s very basic stuff, the ideal gas law plus gravity. The atmosphere doesn’t do this in the IPCC-approved GCM’s because they are hydrostatically constrained. Large upward or downward shifts in air density can’t happen. This means that all the GCM’s show water vapor feedback as positive when it is actually negative. Now, for what it is worth, a strong negative feedback of this kind also makes the faint early sun paradox much less paradoxical. With negative feedback you have very low overall climate sensitivity to changes in solar input flux. A 30 percent drop in flux becomes a relatively small drop in temperature, and we avoid “snowball Earth” conditions. I don’t mean to derail the original discussion. But the point seems relevant to the discussion of Phil Jones and his understanding (or lack thereof) of solar forcing. If I recall rightly, the sun took a fair-sized drop in geomagnetic activitiy, late in 2005. The thought struck me only moments ago… could there be any correllation between geomagnetic activity, and the flipping of the PDO to cold phase? I’m just wondering if ocean mechanics have a delayed response to such changes. Sorry if the question is badly worded, doing this on the fly. in my experience, whenever you ask oceanographers tricky questions, you get as many different answers as there are oceanographers. Seawater contains a lot of metallic ions: sodium particularly. How the varying salinity (and it varies a lot) affects the conductivity and flows i don’t know. The nature and power of the electrical interaction of the ocean with the Earth’s magnetic field is an interesting and poorly understood area. I suggest you google around and report back. I think there are distinct modal changes in a number of different things but none of this is clearly understood nor even clearly the case. I suspect the answer is no. Reason: geomagnetic activity is one of the longest datasets, if not very accurate. I am unaware of a similar change similarly coherent with past PDO phase change. Sadly you will have to return in hundreds of years to get the answers. In electronic circuits the “Q” is the coupling between circuits and is the factor that controls signal or energy transferred between circuits. The higher the “Q” the better the coupling. The earth’s magnetic field has been dropping and the sun’s field has been dropping, the “Q” has been reduced, less coupling, a reduction of energy transferred within the coupling field is the result.